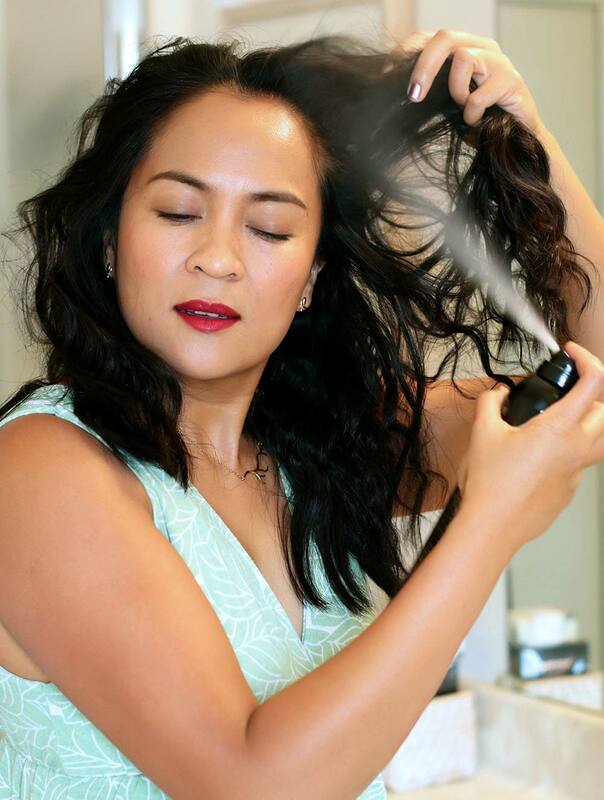 At $42, Oribe Free Styler is a borderline redonk splurge, but it might be worth it if you’re plagued by cowlicks… For something more reasonably priced, I also like $15 L’Oréal Elnett, which has a similar flexible hold and finish. Flexible Polymer Blend gives light styling hold with a brushable, satin finish. Ginseng Root Extract prevents breakage by promoting healthy hair. Kukui Seed Oil moisturizes and provides a protective barrier against environmental stressors and free radical damage. Hydrogenated Cottonseed Oil strengthens and promotes elasticity while adding softness to each strand. There are so many different versions of Elnett, but I like the Extra Strong Hold Unscented Hairspray best because the scented version reminds me of the perms my grandma gave me as a kid. That isn’t an exact dupe, and I like Oribe Free Styler’s flexible hold better, but it’s still pretty good, and you can find it at most drugstores. The L´Oréal Elnette always makes my hair crunchy – maybe I am too close when spraying? What lippie are you wearing in that photo? I love the color! Elnett had been my “go to” for years until my hairdresser gave me Goldwell Stylesign 4 Perfect Hold Big Finish Volumizing Hair Spray. I was surprised, but I like it better. Less crunchy, very fine spray, not a strong scent and it keeps the “halo hair” in check. About the same price as Elnett. I don’t even want to try the Oribe. I’m sure I would like it, but the price! Hi! I don’t know about the hairspray…but your skin (beautiful light in the center!) and your lipstick in this photo is stunning! I absolutely love Elnett hairspray. I use it every day!! I also use the unscented version. The smell of the scented version drives me over the edge for some reason. I love perfumed products, but Elnett has a very stale perfumey smell. Sometimes I get it on sale at Target or Rite-Aid, so that’s a plus. I showed a friend of mine the can, and they couldn’t believe how tall it was. LOL!! This might be one. I’ve only just recently dipped my toe into the beautiful pool that is Oribe products, so I may check this out. I’m almost overwhelmed by his awesome products. In the “I can only layer so many things” kinda way. On a related note-do you have a rec for hair dryer? I did my due diligence of doing a search through your posts before asking-but it has been quite a while since my high priestess of all things beauty has posted about such a topic. I had my sights set on the twinturbo 3800, but am now reading mixed reviews on those recently manufactured (espesh from pros who prev owned and swore by this model). Thanks!! It’s been a while since I’ve reviewed a hair dryer (over ten years) because I still have the one that I reviewed on the site eons ago, LOL! Believe it or not I have the original first generation t3. It’s *still* going strong. I would go with a t3 or a GHD. I have several GHD hair styling tools and they’re top notch (just haven’t tried the hair dryer yet). I’m jealous your first generation T3 Bespoke dryer is still working! Mine caught on fire and died in August 2013. Almost six years, I have not found a dryer I like as much, and that includes GHD. I wish T3 would bring back the original Bespoke dryer. Oh my gosh, that’s so scary! What happened when it caught fire? I hope it wasn’t too close to your head, OMG! I was actually drying my hair when I smelled smoke at the nozzle and then it sparked at the outlet. Thank goodness the house did not burn down!! Let me tell you, it was a sad day—that was the best dryer EVER and my hair does not look as good as it did before the dryer died. It’s amazing what a difference what one tool really can make. Love your blog and all of your posts—keep up the awesome work!